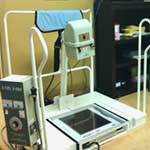 Our office is equiped with a new state of the art scanner for orthotics. A tool that will allow a digital scan of the feet, the digital foot scanner helps the doctor to screen for imbalances that contribute to problems in any number of places, like your knees, hips, and low back – even if your feet don’t hurt! Your feet are the foundation for your entire body. Like any structure, your body’s foundation must be balanced to support the weight above it. If the arches in one or both of your feet collapse, your body doesn’t get the correct postural support, causing an imbalance in your skeletal frame. This new technology helps Dr. Fahoury develop care plans and use postural support, like custom-made orthotics, to obtain positive results in nearly everyone – from children to seniors. Instead of X-ray film, digital radiography uses a digital image capture device. This gives advantages of immediate image preview and availability; elimination of costly film processing steps; a wider dynamic range, which makes it more forgiving for over- and under-exposure; as well as the ability to apply special image processing techniques that enhance overall display of the image. edema effect on tissues that are exposed to the laser. Painful conditions accompanied by swelling or inflammation benefit from this technology. Photons of laser energy penetrate deeply into tissue and accelerate cellular reproduction and growth. As a result of exposure to the MLS Laser, the cells of tendons, ligaments and muscles repair themselves faster. As inflammation is reduced, pain subsides very quickly. In simple terms, laser energy kick-starts the healing process, thereby speeding up recovery. Unlike some pharmacological solutions, there are no known negative side effects. 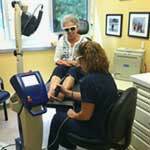 Laser therapy is cleared by the FDA and is safe and effective.Laser Therapy is painless. Most patients report no sensation at all while receiving laser therapy. Treatments average 8 minutes. MLS is fast-acting; many patients in high levels of acute pain experience relief after the first or second treatment. Over 90% of patients experience positive results after the third treatment, with the average course of treatment being 7 to 10 sessions. In many cases, by the 3rd or 4th treatment, swelling is greatly reduced and there is a rapid relief of pain. The effects of MLS Laser Therapy are cumulative; therefore, expect to see improvement as you proceed through your Treatment Plan. Chronic conditions can be controlled with regular treatments. Acute conditions usually subside quickly, typically within one phase of treatments.It is critical that once you start, you complete the course of treatments recommended by your doctor or symptoms are likely to reoccur. Laser therapy has been cleared by the FDA and proven successful as evidenced by extensive and credible studies conducted in our country’s finest institutions including Harvard University. We are proud to be on the medical technological forefront by offering MLS Laser Therapy. We have invested in the very best technology as a key component of our continuing quest to offer the finest in health care. MLS Laser Therapy is an effective, and very affordable non-invasive way to manage pain, inflammation, and a number of other health conditions, without the need for painful injections, mediciations or surgeries. Thank you for your interest in the Company’s Human Amniotic Membrane Allograft. MiMedx is committed to providing safe and effective bio-implants for a wide range of surgical applications. We believe that as a patient facing a surgical option, having access to the right information can play a vital role in the decision making process. The information displayed on this page is intended to provide you, the patient, with an overview of the utility of human amniotic membrane; and should be used for informational purposes only. Patients and their surgical cases are typically unique, and communication with your surgeon is the most effective way to obtain specific answers to your questions or concerns. What is the Amniotic Membrane? The amniotic membrane is the innermost layer of the placenta which lines the amniotic cavity. The membrane itself is made up of a single layer of tissue containing specialized cells. These cells allow the membrane to provide specific functions which aid in healing. How is the Amniotic Membrane used? Human amniotic membrane has been used since the early 1900’s, and was recognized for its ability to treat various types of wounds. Presently, amniotic membrane is experiencing wide spread use in the area of ophthalmology (in eye surgeries), as well as for various other surgical indications, as a patch implant, commonly referred to as a “biological dressing”. How safe is Amniotic Membrane? MiMedx uses the patent pending Purion? process for the processing of amniotic membrane tissue. The process technology and donor screening follow strict guidelines as set forth by both the Food and Drug Administration (FDA) and the American Association of Tissue Banks (AATB). Eligible donors are all living mothers which have given full consent and must have delivered a live birth via cesarean section. Serologic blood tests are then performed to rule out the potential for infectious disease transmission. The complete process concludes with validation by an outside source to ensure that the procedural process results in a safe and effective implant. Ask your surgeon about Human Amniotic Membrane today. 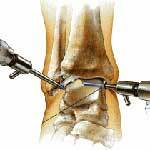 Arthroscopy, is an invaluable tool in the treatment of the foot and ankle. It was first developed for knee surgery in the 1960s. Small joint arthroscopy followed in the 1980s and as the technology and equipment improved, arthroscopy was adapted to the multiple foot and ankle joints by specialist orthopedic surgeons. The joint is visualized using a small (4.5 mm or 2.7 mm diameter) telescope (fiber optic camera) inserted through very small incisions called portals. The surgeon can then see the joint on a high definition screen in theatre. Specialized miniature instruments are then introduced into the joint through another portal. These needle-thin instruments are operated by the surgeon using a foot pedal operating panel.Arthroscopic techniques require a high level of surgical skill, operating in three dimensions, guided by a two dimensional image on screen. A new procedure called Endoscopic Plantar Fasciotomy now gives patients an excellent alternative to the more invasive surgery when fascia inflammation does not respond to non surgical treatments such as orthotics, NSAID’S, physical therapy, injections etc. Using this new technique, a tiny incision is made through which the endoscope is inserted into the heel area. The fiber-optic instrument transmits the image to a television monitor mounted in the surgical area. This allows an excellent view of the plantar fascia. 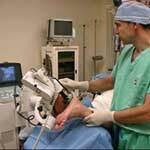 An endoscope is used to cut away a small part of the plantar fascial tissue and to relieve pressure and tension. Tissue usually grows back into the gap that was left from the incision and results in reduced tension and relief from pain. There are many advantages for the patient. E.S.W.T treats a variety of conditions using shock waves, or Extracorporeal Shock Wave Therapy (ESWT), outside the body. The treatment is non-surgical and non-invasive. This quick, effective procedure harnesses intense but very short energy waves to heal many chronic painful orthopedic conditions. The benefits for you? No surgical risks, no downtime, no time and money wasted on treatments that don’t work. Just proven, effective pain relief. The answer you have been seeking is here. Extracorporeal Shock Wave Therapy (ESWT) is a popular treatment method used to combat common concerns including heel pain, plantar fasciitis, Achilles tendonitis, tennis elbow, shoulder tendonitis, lateral epicondylitis, and more. It is considered a break through treatment that can make common problems like heel pain virtually obsolete. Many people with chronic pain problems are turning to ESWT to find relief from their pain. ESWT is an FDA approved form of treatment. It is a non-surgical approach to pain relief that is used regularly to cure common problems like plantar fasciitis and Achilles tendonitis. The therapy works by targeting shock waves directly to the area that is experiencing pain. This non-invasive procedure typically lasts less than 30 minutes. Statistically, over 90 percent of patients that receive this therapy experience a reduction in their pain. In patients that suffered from plantar fasciitis and heel pain related problems, the pain reduction was remarkable. Nearly all patients had successful results with only one treatment of ESWT. For this reason, many people are turning to ESWT to treat their injuries. One of the main benefits of ESWT is the low risk attached to the procedure. The therapy is treated extracorporeally. Patients receive the therapy outside of their body instead of receiving an invasive surgery. This promotes a faster recovery time, and it also minimizes the side effects from the treatment itself. Recovery from ESWT is a gradual process, however the pain will not get worse. In the process of ESWT, damaged tissue cells begin to rebuild. Therefore, healing of the injured area will occur over a few days, weeks or months as these new cells develop. In some rare cases individuals will experience soreness or bruising after the treatment. ESWT is a great option for patients that have chronic pain. Individuals that have tried other options with no results and are still experiencing pain will benefit from ESWT. It is important to try this therapy before the pain gets worse. If the injury gets worse or spreads to other areas of the body, ESWT may not be an option. Platelet rich plasma (abbreviated PRP) is a new treatment used for some common orthopedic conditions. PRP is a concentration of platelet cells taken from your blood, and these platelets have growth factors that may help in the healing process of chronic injuries. Growth factors are chemicals that signal the body to initiate a healing response. By injecting PRP into areas of an injury, the hope is to stimulate and optimize your body’s ability to heal the chronic conditions. PRP is obtained from the patient. Blood is withdrawn from a vein in the patient’s arm and the blood is placed in a centrifuge, a machine that spins at a high speed to separate the different types of blood cells. The physician extracts the platelet-rich portion of the blood, and injects this into the area of injury. PRP injections are given as soon as the blood has been spun and the platelets separated. Some physicians may choose to add an “activating agent,” usually either thrombin or calcium chloride, while some inject just the platelets. Studies have shown that the tendons being injected can also activate the PRP, so the activating agent may not be necessary. There is no clear science to justify a particular quantity of PRP and number of injections needed. Most physicians perform one injection, although sometimes PRP injections are given as a series of injections over a span of several weeks. We know from laboratory studies that PRP can help increase certain growth factors that are important in the healing process. What we do not know is if this makes any difference in healing when PRP is injected into an injured part of the body. Clinical studies that have been done so far do not clearly demonstrate if PRP is more effective than other treatments. While there are reports of cases of success, it is not known if these successes are better, or worse, than other standard treatments. Currently, investigations are underway to determine if PRP is more helpful than other treatments for chronic tendonitis. PRP injections are usually done in an out patient surgi-center under local anesthesia. The procedure takes about 30 minutes in order to withdraw the blood, spin the blood in the centrifuge, and inject the PRP into the injured area. Finding a physician who provides PRP injections can be a challenge, but most commonly these are offered by orthopedic physicians who specialize in the care of chronic sports injuries. PRP injections are not covered by most insurance plans, so there is usually a fee for providing this service. If your insurance does not cover these injections, you can try to appeal to the insurance provider, but because there is little scientific evidence to support PRP use, the likelihood of coverage may be low. Most physicians charge between $500 and $1,000 per injection, Fees for PRP injections vary widely, and you may be able to work out a payment with your physician. Side effects are uncommon, but they are possible. Whenever a needle is inserted through the skin, infection can occur. The other more common side effect of PRP injections is an increase in inflammation and pain after the injection. PRP injections are not recommended in individuals with bleeding disorders, those taking anti-coagulation medications (e.g. Coumadin), or those who have cancer, active infections, or are pregnant. Hall MP, et al “Platelet-rich Plasma: Current Concepts and Application in Sports Medicine” J Am Acad Orthop Surg, Vol 17, No 10, October 2009, 602-608.